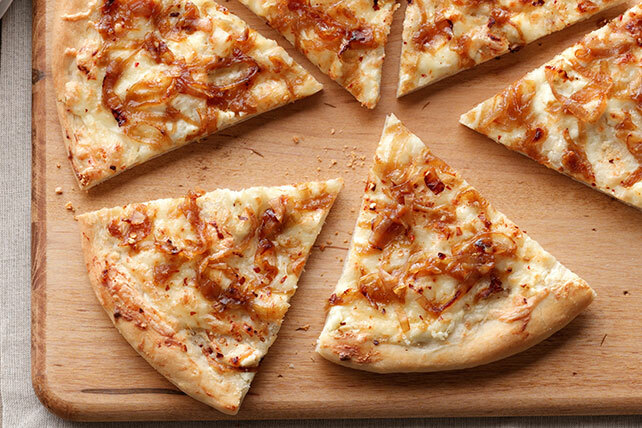 The caramelized onions bring the gold; the super-easy, creamy cheese sauce contributes the white. You may even lose the delivery guy's number. Meanwhile, place pizza dough on lightly floured baking sheet; pat to 16x12-inch rectangle. Mix garlic and remaining oil; spread onto dough. Bake 10 min. Spread cream cheese onto crust; top with remaining cheeses, onions and crushed pepper. Bake 10 to 12 min. or until crust is golden brown. Caramelized onions can be made ahead of time. Cool, then refrigerate up to 2 days before using as directed. Prepare as directed, using PHILADELPHIA Smoked Salmon Cream Cheese Spread and substituting 2 tsp. capers for the crushed red pepper. For added color and texture, serve with a mixed green salad tossed with your favorite KRAFT Light Dressing.